I'm expecting my book, Presenting For Humans: Insights for Speakers on Ditching Perfection and Creating Connection, to be available on Amazon by the end of March, and hopefully to have some hard copies in hand to sign for my VIP supporters! If you’re tired of trying to impress people and fit yourself into a cookie-cutter mold of “speaker” that doesn’t even exist, this book is the resource to help get you there. When you look inside this book, you might be surprised to discover that it's not a public speaking “how-to” book. It’s certainly not an academic tome. There’s no step-by-step formula or system to follow, and you won’t learn what to do with your hands or how to write a keynote. What you will learn is how striving for perfection gets in the way of making the connection you crave. You’ll learn how letting go of your need to impress your audiences frees you up to stop taking yourself so seriously and to have fun on stage. You’ll learn how you can break the habit of hiding behind a rigid façade of “professionalism” that creates an emotional barrier between you and the audience. And you’ll learn how being real, transparent and genuine is a gift of connection you give to your audience that brings them into your world and allows you to access theirs. My philosophy is that public speaking is fun, it's an awesome way to express yourself creatively, and that connection and engagement are worth more than a thousand techniques. 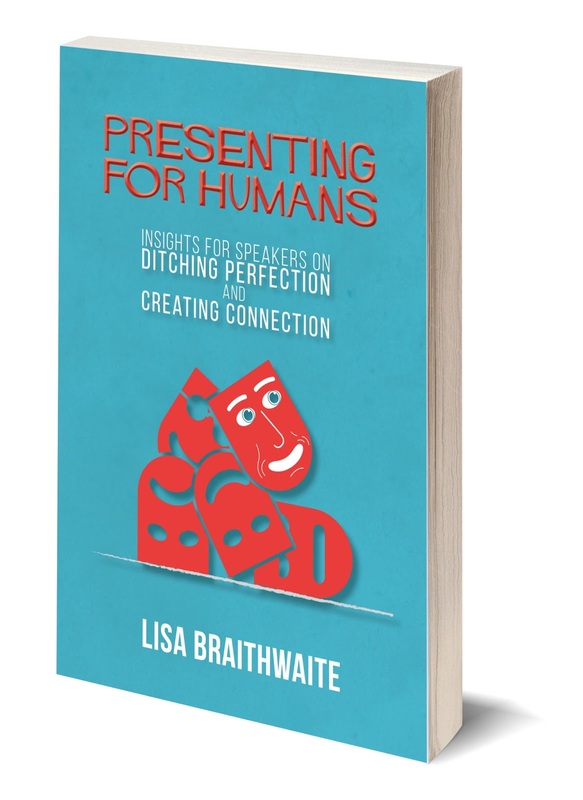 And that’s why Presenting for Humans: Insights for Speakers on Ditching Perfection and Creating Connection focuses on upgrading your mindset around how you perceive and create your relationship with the audience. Through short essays based on everyday encounters and experiences, and reflection questions at the end of each section, the book asks you to question what you already know about speaking. Presenting for Humans encourages you to create a meaningful and memorable experience with every presentation. It prompts you to come from a place of service, of doing what’s best for your audience rather than what’s easiest for you. It suggests that you step back and take a break from techniques and rules, instead focusing on boldly revealing your true self on stage, being present, and creating connection. If you'd like to be the first to know when I start taking pre-orders (for signed copies), you can join my book launch advance notice list here. This book has been ten years in the making, and I can't believe it's almost here!